Simon Rogan is Chef Patron at L’Enclume, the double-Michelin star, five AA Rosette winning restaurant in Cartmel, Cumbria. What began as a stand-alone venture 15 years ago has developed into a village-wide industry, with sister restaurant Rogan & Co, a development kitchen called Aulis, a hotel, and a farm dedicated to producing the finest ingredients from the Lake District. Rogan has achieved incredible success, he is widely regarded as one of the most influential British chefs and now employs one in every 20 people in Cartmel. Mr Rogan, what’s the secret to a successful restaurant? Every day thinking of ways to make it better, never stand still and innovate your customers! Providing the best experience you can and to invest in your team. A steady, loyal workforce breeds quality and consistency. L'Enclume is soon to celebrate its 15th anniversary and is still going from strength to strength, how do you maintain your passion and creativity? I am never satisfied and I am still of an age where my passion and drive are still there. I want to make my restaurant the best it can possibly be. I feel that I am still not quite there yet but will I ever get there, that is the question?! It also helps having a superbly talented team around me. I love Thai food, always have and always will! Any memorable food disasters you'd care to share? Luckily there haven’t been many, but when I was between my last job and opening L’Enclume I did a bit of temping to keep my hand in and I burned 500 portions of chicken drumsticks which I had left in the oven all afternoon – sorry that particular hotel – you know who you are!! If you had the chance to go to any restaurant in the world right now, which would it be? After guesting at Wasted at Selfridges, it would probably be Blue Hill at Stone Barns, mainly because their ethos and belief are similar to L’Enclume and I would love to see their operation. The food also looks really good! Tell me about the best meal you have ever experienced. La Ferme de mon Père in Megève by Marc Veyrat, when he was at the height of his powers. The whole experience blew my mind! The location, food, service and restaurant was truly magical and obviously his style of food at that time was a major influence on me and probably set me on the direction where I am today. And what’s the most bizarre thing you’ve ever eaten? Jellyfish! It can only be described as eating crispy rubber bands. And then, either side of this course was a big slice of monkfish liver and a dish of sea cucumbers. It was probably the most challenging three dishes I have ever eaten in my life! Which chef, past or present, would you most like to have a drink with, and what would the drink be? Louis Outhier, the great three Michelin star chef from Southern France. When I was dreaming of becoming a chef I had a book which featured heavily on him and it is one of the true chef regrets of my life that I never worked for him as I loved what he did. He was a true pioneer of seasonality and locality. Aside from food, what are your other interests? Family, music and cycling. To be honest I don’t have that many, but anytime I am away from the business I cherish time spent with my family. Four years ago you opened Our Farm. 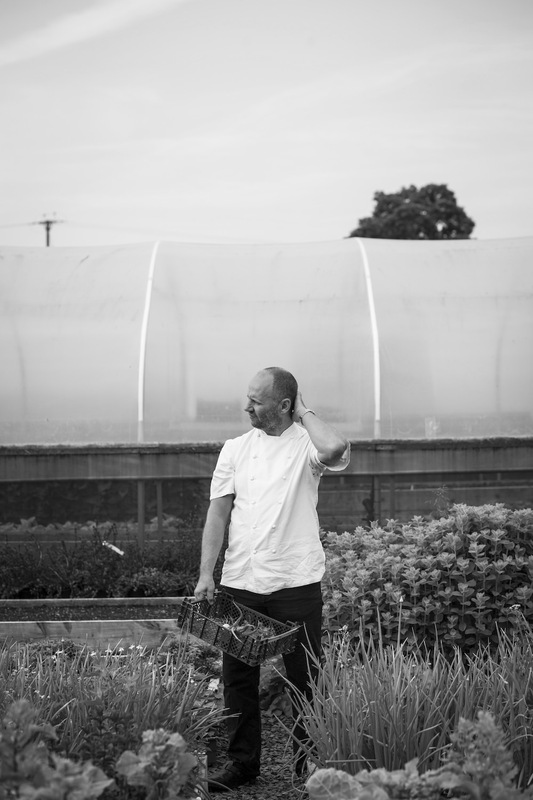 Has growing your own produce changed the food you serve at L’Enclume? Our Farm has changed EVERYTHING! Our quest for technique in our cookery has reduced because our quest now is to produce the most perfect ingredients. Simplicity is perfection and flavour is everything!